Cut the pineapple in half lengthwise. Scoop out and reserve the middle of each half, leaving ½-inch to ¾-inch of flesh along the edges. Finely chop the reserved pineapple. Combine the chopped pineapple with any juices released and place approximately 1 cup of it in a small saucepan. Add the water, salt, chili flakes, butter and sugar to the saucepan, and bring to a boil over medium-high heat. Add the rinsed white rice. Bring to a simmer, then reduce heat to low and cook for 15 minutes, or until the rice is fully cooked. Once done, fluff with a fork. While the rice is cooking, combine the garlic, soy sauce, honey, rice vinegar, and ginger in a small bowl. Add the sauce to the chopped chicken and let sit while your pan heats up. Heat the olive oil in a large sauté pan over medium-high heat. Use a slotted spoon and drain the chicken from the teriyaki sauce, reserving the sauce. Add the chicken to the hot pan and brown on all sides. When the chicken is fully cooked, add the reserved sauce to the pan and cook until the sauce has reduced and thickened. The sauce should evenly coat the chicken. Sprinkle with sesame seeds. 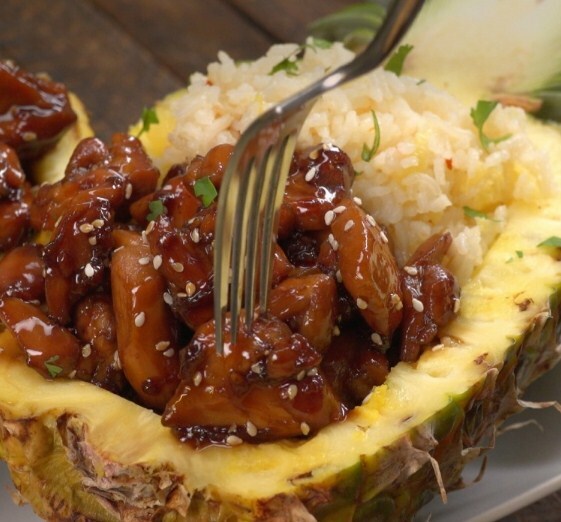 To serve, spoon about ½ cup of the pineapple rice into one half of each hollowed-out pineapple boat. Fill the remaining half with the teriyaki chicken. Garnish with cilantro, if desired.